Will your apartments last beyond 50 years? Apartment or independent house? It is an endless debate. There are valid arguments to buttress the claims of both sides. While jury is still not out, there is a growing demand from certain sections of the housing sector which argue that builders must ensure that the apartments they build should be able to face the vagaries of time for at least six to seven decades. There are apartments like Sagar Apartments and Sujan Singh Park in Delhi to name few, which are standing tall even after 40 to 60 years of their construction. Ever since the winds of liberalisation have started blowing across the country over the past two decades, demand for residential space has been constantly going up. Boutique apartments are a good option for those HNIs who look for exclusivity as well as the security of a gated community. Kamrup Housing Projects is coming up with one such project in Sector Chi V, Greater Noida (adjacent to Yamuna Expressway). Shridev Sharma, MD of Kamrup Housing Projects Pvt. Ltd., talks about boutique apartments that cater to a niche clientele. Serious bonsai growers should know the various techniques of propagating plants. 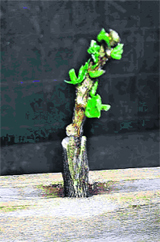 Plants are propagated from seeds, cuttings, layering and grafting. Attached bathroom: The southwest corner of the room should not be vacant. An attached bathroom could be built on the west or north sides of the room. Mid-sized Real Estate Company, Ashiana Housing Limited, has reported a revenue growth of 96 per cent in the second quarter ending September 30, 2011 as compared to the corresponding quarter last year. Apartment or independent house? It is an endless debate. There are valid arguments to buttress the claims of both sides. While jury is still not out, there is a growing demand from certain sections of the housing sector which argue that builders must ensure that the apartments they build should be able to face the vagaries of time for at least six to seven decades. There are apartments like Sagar Apartments and Sujan Singh Park in Delhi to name few, which are standing tall even after 40 to 60 years of their construction. Venerable Bollywood stars Dalip Kumar and Manoj Kumar own flats at Sagar and Khuswant Singh lives at Sujan Singh Park. Well, it is no secret that economic factor and fast lifestyle have sounded the death knell for independent house culture in India. As the cost of independent house is so staggering many buyers do not even consider the option of having an independent house nowadays. Land prices have skyrocketed making the purchase of a site and construction of a house almost impossible for a common man. Now even small cities are switching over to the flat culture. But for every home buyer in India buying a home means a place of their for the coming generations of the family. And most flat buyers have this niggling doubt in their minds as to how long would their dream house last given the standard of materials used in the construction. So the important question that flat purchasers grapple with is that whether like an independent self-built house a flat will also last for more than 50 years? Well, it is an important question. Noted architect Azmal Zaheer Khan of capital's Kothari Associates is of the view that unlike independent houses, we are witnessing apartments which are unlikely to remain in a perfect state for over 30 years they as they are not maintained nicely. "As far as an independent house is concerned, it can, at any point of time, be rebuilt to suit changing tastes and requirements. “An independent house can be expanded horizontally if space permits or vertically by adding more floors. But both these things are impossible in the case of an apartment unit. As Khanna says, "I meet many people who have sold their indepenent houses and later rue their decision," adding, "They regret their decision of selling house as they find that the quality of construction of flat is bad, especially the plumbing and electricity." There is no doubt that now given the astronomical land rates, building an independent house is increasingly becoming tough. However, experts are of the view that generally concrete apartment buildings in India last only for 30 to 50 years as compared to the expectation of 70 to 80 years. The short life span is an economic burden for not only owners and residents but also for the nation as a whole. According to Azmal Zaheer, the major factor influencing long-term service life of concrete structures is the nature of exposure to nature’s vagaries. He is of the view that adverse conditions such as ground contamination, high temperature, humidity, fluctuating temperature and relative humidity can cause damage and reduce the life span of the structure. From the investment point of view, too, flats give a good return only till a certain ‘age’ and most old constructions become virtually dead assets after a certain price appreciation. 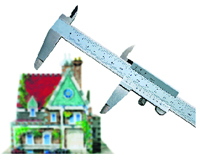 It is in this regard that well maintained buildings score over others. Reality experts say that Vasant Kunj and Dilshad Garden DDA flats were constructed at a same time in late 80's but the value of Vasant Kunj is far more because they are very well maintained by the residents themselves also. While we talk about the longer life of our apartments, those who use these hardly feel duty-bound to spend money for the purpose of maintenance.R.K. Sinha, CMD of Service Master Clean, informs that while there is growing awareness to keep apartments in a perfect condition, even the people who live in flats worth more than a crore don't like to pay regular upkeep charges. With such a mentality, how can you expect to keep buildings nicely for many decades? Sanjeev Srivastava, MD of Assotech Builders, is of the view that in order to make the life of your apartment more and more, it is very important that the building (apartment) gets regular maintenance. “It is advisable for the residents of the apartment to spend some money on monthly basis and in consultation with architects and civil engineers to keep their building nice”, Srivastava concludes. Upkeep of buildings involves a lot more than just housekeeping and cursory maintenance. Far from being confined to plumbing and electrical work, maintenance of complexes extends to include a host of items that require a fully functional office and maintenance staff on call round-the-clock. Experts also say that upkeep service not only includes housekeeping and emergency maintenance but also beautification and maintenance of gardens and common areas. The service is typically managed by a manager and office personnel complete with a wireless network to track field staff. While one can debate on the subject endlessly, one can see the pathetic state of maintenance of even noted residential complexes. Some of the most prestigious residential complexes are in an appalling state when you go inside. But these negative aspects fail to deter the customer, as "maintenance of individual houses, especially large ones with a garden, is increasingly becoming a problem. With increasing commercialisation, residential areas are fast becoming unlivable and this is especially so while living in an independent house. "I don't have to say here that if you want that your apartment remains in a nice condition for close to half a century then treat it with care. If apartments like Oberoi Apartments near Civil Lines and Sujan Singh Park still look grand, it is because they are maintained very nicely, otherwise they would have crumbled," says Alimuddin Rafi Ahmed, CMD of ILD group. Ever since the winds of liberalisation have started blowing across the country over the past two decades, demand for residential space has been constantly going up. With one-sixth of the world's population, India needs around 27 million houses in the next three to four years thus creating a huge investment opportunity in the real estate sector, according to North India Real Estate Report 2011, an initiative of Franchise India. Changing scenario of industrialisation, entry of multi-national companies and the advent of software parks have triggered the growth of emerging residential market in India today. Recent times have witnessed an increase not only in the quantitative demand but also in the qualitative demand for organised residential property. With a large number of Non-Resident Indians (NRIs) and persons of Indian origin (PIOs) investing in India, the type of residential requirements have also changed thus putting a demand on high quality international style residential spaces. Based on the real estate boom in India all big developers and builders have launched their major projects in all big cosmopolitan cites in the segments as needed or demanded by the local markets. Commenting on the same, Franchise India's President Gaurav Marya said, "The Report gives an extensive analysis on the North Indian Realty market and provides a comprehensive learning curve for the fraternity as a whole, including developers, brokers and investors. 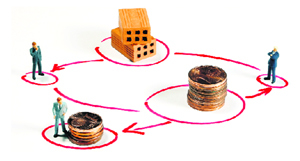 The real estate sector in India is on a growth path. The development in the real estate market embraces spurt in both commercial and residential spheres. Estimates say that there would be shortage of 26.53 million houses during the 11th Five Year Plan (2007-12), which provides a big investment opportunity." According to the report 2011, Delhi and the National Capital Region (NCR) are indeed the country's most sought after real estate investment destinations. Tier-II and Tier-III cities too are witnessing a great boom in the demand of organised residential property. Besides cities like Chandigarh, Ludhiana and Jalandhar, developers are betting big on housing and commercial projects in satellite cities like Mohali, Dera Bassi, etc across the region. States like Haryana, Uttar Pradesh and Rajasthan, too, are witnessing trends that are comparable. The affordable housing segment is also expected to play an important role in the growth of the real estate sector in India in 2011, on the back of increasing demand for such housing. Affordable housing will be a key factor in driving the sector and developers are creating interest avenues in this area for effective and customised implementation of projects. Further, growth in the infrastructure sector is also expected to accelerate real estate activities, in commercial as well as other residential segments, during the coming year. Q. I am occupier and tenant of one shop. On the basis of my occupancy and being a tenant of the custodian the department concerned had transferred this shop to me in 1969 and a 'Deed of Conveyance' was also issued to me. In 2006 one party after concealing fact and producing some documents, without giving any notice to me, fraudulently got the Registry of my shop in its name. Now I fear that on the basis of this Registry, they may sell my shop to some bad elements. Please tell me what should I do in this case? I am a middle class senior citizen and can't grease the palms of greedy officers who have approached me. A. I presume that the property referred to in your letter was vested to the custodian by virtue of an enactment passed by the competent authority. Therefore, the conveyance deed executed in your favour by the custodian is a valid document for proving your ownership rights in the said property. You are in possession of the shop and any person claiming ownership on the basis of a forged document will not be able to sustain the claim in the court of law. However, you can't take any action on the basis of any verbal information. In case you are sent a legal notice, on the basis of which a person claims to be the owner of the property, then you will have to approach the competent court for getting the matter settled. I can understand your predicament that you are a senior citizen and, therefore, will have difficulty in fighting a court case. However, on the basis of the facts given in the query, it may be inevitable. The original conveyance deed and mutation records of the corporation would enable you to prove your ownership. l I was allotted a plot by HUDA in Karnal in August 1995, for total amount of Rs 1, 70, 003. Out of this total amount a sum of Rs 15, 455 and Rs 27, 048 were paid within 30 days of the allotment. The balance amount was paid in six installments with interest and extension fee amounting to Rs 2, 02, 482 up to March 2003. Besides this, a sum of Rs 10,100 was paid as conveyance deed cost and Rs 17,850 as non-construction extension fee was paid in May 2011. Hence, a total amount of Rs 2, 72, 933 was paid by me between August 1995 and May 2011.
l	The possession of the said plot was taken by me in June 1998.
l	The plot in question was sold by me in May 2011, for Rs 31 lakh. l	I purchased a house/flat in Solan for Rs 11 lakh in June 2011. In addition to it, an amount of Rs 77,000 was paid as registration fee in Tehsil Office. l	Out of the balance amount of Rs 19, 23, 000 (31, 00, 000 - 11, 77, 000), a sum of Rs 12 lakh was gifted to my three daughters (Rs 4 lakh each). I want to know how much amount I have to deposit as income-tax/capital gain plus E.C. keeping in view, the price index of land and the amount gifted to my daughters. A. On the basis of the figures given in the query, the aggregate cost of plot works out at Rs 2,72,935 as against Rs 2,72,933. The indexed cost thereof works out at Rs 5,02,275. The amount of tax payable on long-term capital gain of Rs 14,20,725 would workout at Rs 2,92,669 @ 20.6%. The above amount of tax has been computed after taking into the account in the indexed cost of the plot at Rs.5,02,275. The indexed cost has been computed on the presumption that the entire amount including six installments of Rs 2,02,482 was paid in the year 2002-03. The amount of Rs 12 lakh gifted by you to your daughters will not effect the computation of the amount of capital gain and the tax payable thereon. Q. My father purchased a 165 sq.yd plot in Delhi in July 1965, at a total cost of Rs 900. He constructed a one-room set on the said plot in the same year at an approximate cost of Rs 3,000. As the family grew additions costing Rs 6.55 lakh were made to the house as follows : Year 1975-Rs 5000; Year 1981-Rs 1 lakh; Year 1998-Rs 5.5 lakh. In October 2011, he sold the house for Rs 80 lakh and purchased a flat costing Rs 45 lakh. l	What will be capital gains tax on the remaining amount of Rs 35 lakh? l	If he invests Rs 20 lakh in NHAI then what will be tax liability on remaining sum of Rs 15 lakh. Is this allowed? l	He is a senior citizen and a pensioner and does not file income tax return. Will he have to file the Return now onwards? A. You have the option of adopting the fair market value of the house as on April 1, 1981, which would have the effect of increasing the cost of Rs 3,900 to a sizable amount. As you have not indicated the fair value of the house as on April 1, 1981, it is not possible to compute the amount of capital gain. You should approach an approved valuer to obtain the fair market value of the house as on April 1, 1981. It will be possible to compute the correct amount of capital gain on the basis of said fair market value. Q. I want to know about the details of lease of immovable property and also how the word permanent lease differs from perpetual lease? I request you to give details on the above. A. A lease with reference to a tangible property means a contract by which a person owning a property grants to another person the right to possess, use and enjoy it for a specified period of time in exchange for periodic payment of a stipulated price (generally referred to as rent). A perpetual lease is a lease of land without limitation as to time. Such a lease, thus, contains all other elements of lease except that it is extended to perpetuity. I have, however, not come across a case of any permanent lease. Q. You always advise to deposit capital gains amount in capital gains account in a bank before past date of submitting tax return in that financial year. Please clarify some doubts relating to withdrawal of money from that account. l	Do we have to inform the tax department about that account? If yes then what is the procedure for it? l	While withdrawing money from that account for purchasing a plot with intention to build a residential house within the stipulated period or for constructing a residential house, do we have to seek the permission of any income tax authority? If yes, then which authority or one has to submit any other document (affidavit etc) to the bank stating that the amount would be used for the said purpose or the owner can withdraw as much money as he requires and later on give an undertaking that the amount withdrawn was used for the said purpose. Please give all the possible details in this regard. l	The amount deposited under the capital gain scheme is required to be included in the column 'deduction claimed under Section 54 etc.' in the relevant schedule of the tax Return. This column is part of the particulars of long-term capital gain which have to be indicated in the tax return. l	The amount deposited with the bank under the capital gain scheme is required to be utilised for the purposes of construction or purchase of a residential house within the specified period. The bank will have to be informed about the purpose for which the amount is being withdrawn. There is no requirement to seek any permission from the tax department for withdrawing such an amount. Q. I am an NRI living in USA currently and I hold a US passport, am I entitled to purchase a residential plot in a city in Punjab for building a house where I intend to settle after superannuation in USA? A. In Punjab there is no restriction on buying residential property by NRIs. Though some other states like Himachal Pradesh have imposed certain restrictions on purchase of property by outsiders, in Punjab you can buy residential property so you can go ahead and construct a house where you can come back and settle down after returning to India. Q. A residential property was purchased from the Rehabilitation Department, Punjab, by my father at the time of the Partition and a major portion of the cost was adjusted against the claim received by him from the Punjab Government against ancestral property left behind in Pakistan. We are five siblings (three brothers and us two sisters). My father expired 25 years ago and my mother expired recently. Now my three brothers have come out with an unregistered Will as per which the property is to be divided in three portions among them and we sisters will be paid a paltry sum of a few thousand rupees each. The property is worth over two crore now. l What is the legal position with regard to the so-called Will written 25 years ago and declared now, especially in view of the fact that the property had been purchased against the claim of property in Pakistan. l Do sisters have an equal share in the aforesaid property in view of Hindu Succession Act ? l Does the Will have to be probated and NOC to be taken from sisters for this property? l Can the property be transferred without the consent of sisters? A. According to the Hindu Succession Act, every sibling is an equal co-sharer in the ancestral property and natural legal heir. The unregistered Will is not valid in this case without the consent of all co-sharers. It is surprising to know that the unregistered Will has been made public after about 25 years. A probate from the court of law is a must for the Will to be legally valid. 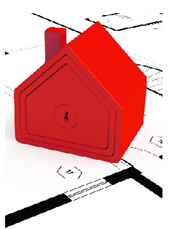 You have a number of options to amicably settle this property matter. A family partition deed can be executed. Or the share of all other siblings can be bought by a single sibling at a mutually-settled price. In any case, sisters' consent is a must for the transfer of property. Without probate from the court or family partition, there will be no clear title of the court. And without a clear title no mutation of property can be done. Q. I had purchased a plot in a cooperative society from an original member in 1998. The transferor had entered into an agreement in writing (December, 1998) with me for the transfer of his membership/share in regard to the plot allotted to him by the Housing Cooperative Society registered at Mohali, along with the 'Agreement to Sell'. The member had given an affidavit with all the original documents (including receipt, allotment letter issued by the housing society in his favour and endorsed in the housing society) and had wished to transfer his share/membership with all the rights and liabilities to me. As per the application made by the member (having all the required documents to be submitted for the transfer of his membership to me) the Administrator of the Society appointed under Section 27 of the Punjab Cooperative Societies Act with the prior sanction of the AR, Cooperative Societies, had transferred the membership to me. But later, the new body of the society neither issued the share certificate to me nor informed me in any regard. The original member expired four-five years back and the society had given possession of the plot to his family. My case is running since 2003 against the society and at present my appeal is pending with DR, Cooperative Societies. To what extent will I able to get justice? A. Under the Punjab Cooperative Act, Register Cooperative Societies (RCS) is the competent authority to decide on all cases, including transfer and ownership rights. Though you have already sought a judicial remedy, first you should have exhausted the administrative remedy of getting your property transferred in your name. Now in Punjab the Right to Service Act is in place. You should make use of this Act and ask the RCS concerned to speed up the hearing of your case as per the deadline stipulated in that Act. In case the RCS does not reply to your application, you are free to move the court to get justice. Shridev Sharma, MD, Kamrup Housing Projects Pvt. Ltd. Your group has come up with boutique apartments. What is the genesis of this concept? Buying living spaces i.e. houses, a flat, bungalows has always been a very popular concept in India. Until now this concept - to give the space to a buyer or family - was predominantly driven by affordability and the buyer's budget. The general trend in the market was to design apartments keeping the same affordability in mind. However, with increase in per capita income and better lifestyle demands of a growing number of Indians the concept of luxury living now has many takers. Hence came the concept of boutique apartments which are created by providing optimum spaces, best of the finishes, with a feel of luxury living. Is there a market in India for boutique apartments? Yes, it is picking up very well because it is increasingly becoming difficult to maintain individual houses and people want no hassles on security front too. What is the state of luxury housing in India in the current scenario? For the upper strata of society, this concept fulfills the need for an exclusive living and the advantage associated with mass housing. The market for boutique apartments is picking up gradually as individual families are growing and families are moving up the economic ladder. What is the USP of your latest project in Noida? This project has all the disaster mitigation measures as required under National Building code 2005 and applicable BIS standards on earthquake engineering are in place. Apart from this top end products are used for finishing. and there is ample provision for open spaces and each apartment is designed to give a feel of an independent house to the owners. What unique architectural and design features have you incorporated in this project? Each apartment is designed like an independent house. and has pre-planned services like AC, plumbing and water supply through ducts. The architectural design makes optimum use of open spaces. There are separate balconies for each bedroom and kitchen. Sky bungalows on the top floor in two levels are designed like independent bungalow with terrace gardens. More and more developers are now going in for eco friendly and earthquake resistant buildings, how popular is this trend in India? 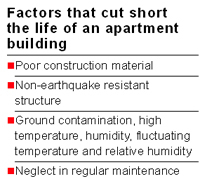 Earthquake resistant buildings are a mandatory requirement under the Disaster Management Act, 2005. It is pertinent to mention that under said Act authorities to respond to disasters are constituted at three levels i.e. national, state and district. Besides other functions, the District Disaster Management authorities have to ensure that the necessary disaster mitigation measures are being taken in the area which falls under the prescribed zones. However, the concept of the green building is still at the nascent stage the required encouragement is yet to be provided by various governments. Serious bonsai growers should know the various techniques of propagating plants. Plants are propagated from seeds, cuttings, layering and grafting. The exotic variety of trees which are not locally available can be grown from seeds. Propagation from cuttings is very handy when a large number of plants of the same species are required for group planting. Three to four inch long cuttings are taken from a healthy plant for rooting. A pot with moist coarse sand is taken and 1-2 inch deep holes are made with a chop stick. The pot is watered, after all the cuttings are placed one by one in the holes. After the excess water is drained, the pot is enclosed in a fresh polythene bag and placed in a shady and fairly warm area. For successful rooting, the soil should remain moist. Rooting period varies for different species and fresh roots sprout when rooting takes place. There are two methods of layering, ground layering and aerial layering. With these techniques of propagation, desired bonsai can be created in a short time. A fairly long, flexible and a healthy branch from the mother plant, which is nearest the roots is selected before the advent of spring, and is stripped of all its leaves except two or three at its apex. A thin strip of bark is removed from the part of the branch to be buried and rooting hormone is applied to this bare part before burying it. The branch is pulled down 5 to 6 inches of its length and is buried under the soil in a pot placed near the mother plant. If necessary, U clamps can be used to hold it down or it can be pressed down with a stone placed at the top of the covering soil. New roots emerge within four to five months and the end nearest to the mother plant is severed and transplanted in a pot. Aerial layering (gutti) is the common technique adopted by most horticulturists. With this technique, the desired bonsai can be created in a short time by making a careful selection of the branch, keeping in mind the bonsai style you wish to create. 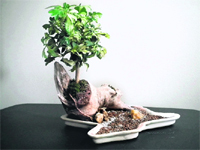 To create bonsai of some slow growing species grafting is essential. This process is also used to create branches at suitable places on a bonsai. The methods used are, approach grafting, wedge grafting and side grafting. Like any other plant, bonsai trees are susceptible to attacks by pests or diseases and can be severely dmaged because of their fairly small size. However, in a healthy bonsai the risk of infection is less. Proper bonsai care is the best prevention, so it becomes imperative to keep the plant clean, provide sufficient light, humidity and fresh air. Regular spray of systemic and contact insecticides keeps the pests away. Root pruning is an integral part of creating a bonsai. No plant can stay in the same container indefinitely. Bonsais are not just maintained above the ground, but their roots also need attention. Bonsai do best if there is an even balance of growth both above and below the soil. Root pruning means removal of the bottom one third of the root ball with a saw and gradually loosening the roots from the bottom and sides of the root ball. Thick and sick roots are clipped to encourage the growth of smaller fine root hairs as they are much more efficient in absorbing water and other nutrients from the soil. l Plant becomes pot bound and is partially pushed out of the pot on its own. l	It becomes difficult for the water to penetrate the soil. l	The plant does not show signs of growth even after fertilizing. Safe: It is better not to keep the safe in a bedroom, but if this is the only place for the safe, it should be located on the south wall, opening north. Cabinet/almirah: If possible almirahs should be avoided in bedroom. But if it is necessary, then these should be placed in a way leaving the south-east, the north-east, the south-west and the northwest corners as well as the east and the north directions. Always keep heavy things, furniture etc. in this portion in every room. Television and electrical appliances: Avoid television in bedroom. If you place T.V. in bedroom, it should be kept in south-east of bedroom. It should never be placed in front of bed as it works like a mirror. Thus placed mirror is not good for health. Heaters, and air conditioners, phones , hand sets, remotes, mobiles should be located in the southeast corner. Colour scheme: Colour affects our mind and changes the mood. Light colours are better than dark ones. 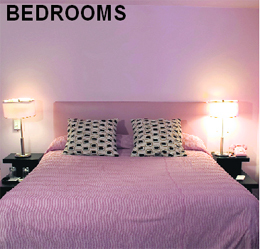 The colour of bedroom should be light rose, pink, blue, yellow and green blue, green and off white. Avoid black and red colour in bedroom. Yellow and white marble should not be used in bedroom. Lighting: Comfortable diffused lighting is the key to excellent bedroom. The bedroom should not have too bright or too dim lighting. Keeping an up-lighter in south-east is good. At night it is advisable to keep a light burning. A night bulb, All out type mosquito repellant which emit light will do. Never keep the bedroom pitch dark. Pictures: Do not display pictures of war, cruelty, sadness, single bird, any animal and wild animals in bedroom. Generally people having religious nature display idols of God in bedroom. They should place these idols in pooja room. Avoid keeping the photo, calendar or idols of any deities in the bedroom. Avoid placing divine idols in the bedroom. The best place for them is your pooja room. Mirrors: Do not use mirror in bedrooms. If it can not be avoided, keep it in such a position that should not reflect your shadow while sleeping. Keep a curtain on mirror to avoid reflection. To avoid mirrors in bedroom means to avoid unnecessary quarrels between the couple. Don’t place your bedroom mirror on the wall opposite your bed, as it disturbs sleep. At such a position, the mirror reflects your image and holds back your stress, rather than allowing you to throw it off. Remove clutter from under the bed, as it keeps your mind lingering in the past and hinders future progress. Wherever clutter exists, you life energy becomes stagnant. Clutter is symbolic of all that has not been completed in your life. It will also not allow you to have a sound sleep, as it disturbs your subconscious mind. Some buildings do not get proper east-west and north-south directions. They have corners only. In bed rooms of such buildings, for getting the proper direction, one should not put bed in an oblique position. — The writer is a Chandigarh-based Vaastu consultant. 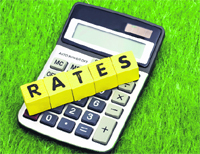 Readers can send their suggestions/queries at realestate@tribunemail.com. Mid-sized Real Estate Company, Ashiana Housing Limited, has reported a revenue growth of 96 per cent in the second quarter ending September 30, 2011 as compared to the corresponding quarter last year. The company recorded the highest ever bookings of 4.82 lakh sq ft alone in the second quarter of the fiscal year as compared to the 3.40 lakh sq ft of bookings in the corresponding quarter last year. Equivalent Area Constructed for the second quarter was 3.27 lakh sq. ft. as compared to the 2.36 lakh sq. ft. in the second quarter last year.